When you hear the name Sea Ray, you think world class yachts, industry leading design and innovation along with offering a boat for everyone, from 18-foot runabouts to deckboats and 50 foot flybridge yachts. What doesn’t come to mind is tow sports and wakeboarding. 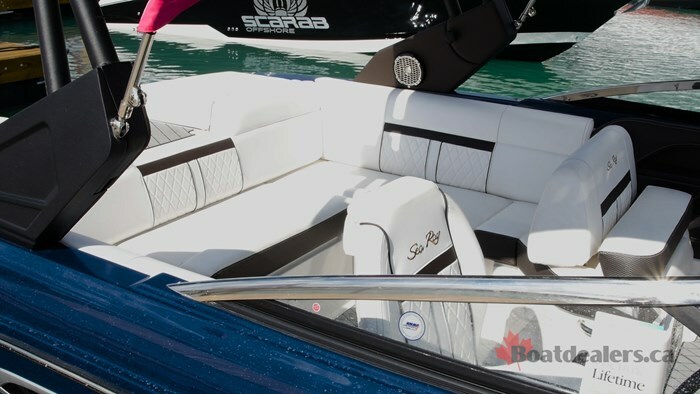 Those familiar with Sea Ray and close to the inboard world will remember the Ski Ray, a direct drive inboard made by Sea Ray from 1991 to 1999 and now a member of the Water Ski Hall of Fame. 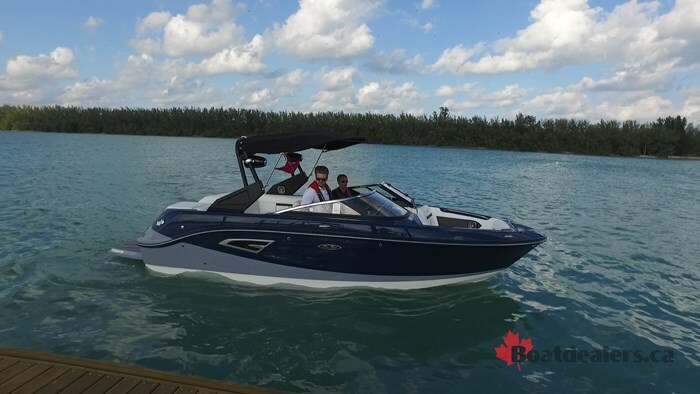 But to most, they only think of the big boats, but Sea Ray is throwing their hats back into the inboard ring with the introduction of the all new SLX-W 230. At 23-feet 10-inches with a 8 and a half foot beam, the 230 is a big boat, especially when you take into account her dry weight of over 5500 pounds. Standing beside her at the Toronto International Boat Show you could see that even though this was a brand new boat to everyone, it commanded immediate respect. There’s a saying that goes “act as if” and the SLX-W 230 definitely acted as if it has been in the inboard market for years. If I were to blindfold you and sit you down into the new SLX-W 230, when I removed the blindfold you would know right away that you were in a Sea Ray. 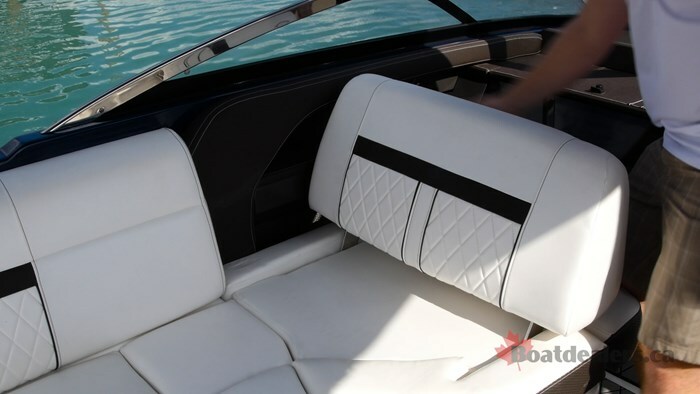 Aside from the obvious branding notes, the interior is a Sea Ray through and through. 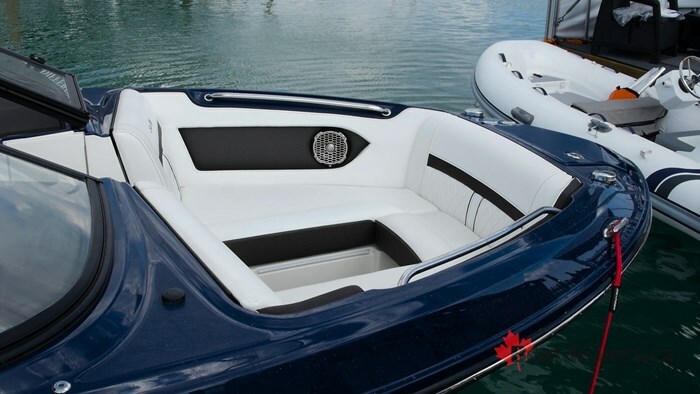 The upholstery uses a blend of textured vinyls, double and cross stitching along with accented piping to create a subtle styled, yet elegant boat. My only criticism is that it’s not “loud enough.” If anything the interior styling of this new boat is too much like a Sea Ray and I would have liked to see more attention getting accents that are going to cause people to stop in their tracks and say “oh wow, this is a Sea Ray?” But for the first incarnation, they’ve still done a fantastic job. It has a watersports friendly layout that allows you to access the cockpit from the swim platform via the center walkway over the sunpad. Once inside there is a J shaped, bench seating arrangement that maximises space and the amount of people you can fit in the boat. 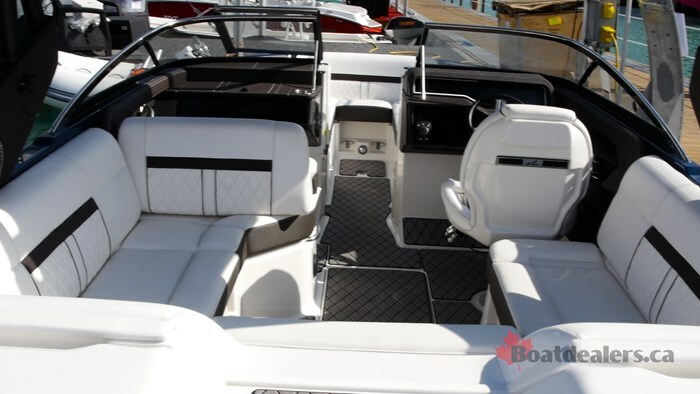 Once again, this is very much a Sea Ray, the seat backs are high, very plush and the inside of the boat is very deep, keeping safety a top priority. The companion seat is a part of that J-shaped arrangement and features a backrest that flips fore and aft, depending on what is in store at the moment. The Captain’s chair is going to be the prime spot as it is a luxurious, high-backed chair with oversized bolster and all controls right where you need them. Speaking of controls, this boat has some exciting new features to come along with it. First of which,is what’s called a “glass helm,” meaning there are no traditional analog gauges. 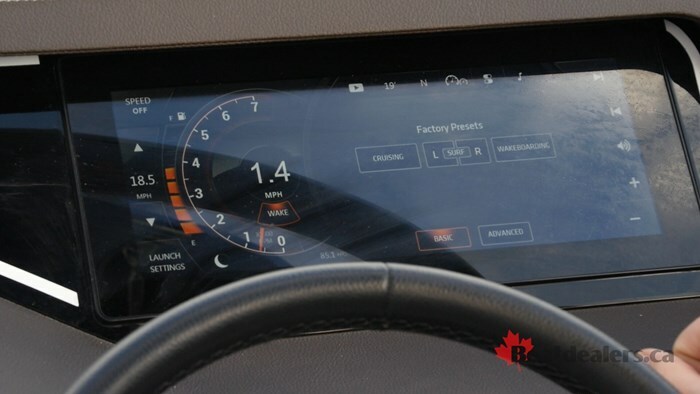 Instead you have what Sea Ray calls their Dynamic Display Screen - a large touch screen in the center of your helm that gives you control of all of the boats systems including the new “Wake-Tech” plates, but more on that later. Next of which is there is a joystick, right behind the throttle controls. That’s right, much like the larger Sea Ray boats, this SLX-W 230 has joystick docking control. And I suppose I should have been more clear with this earlier, but this is, in fact an inboard boat. While other competitors have been using Volvo’s new forward drive to introduce new tow boats to their line-up, Sea Ray is making sure that this is a true inboard. Not only that but is also showcases Mercury’s new Joystick Piloting for Inboards. The problem with inboards is that they are steered by rudders. That’s all well in good if you’re going forward, but when you’re in reverse, there is no thrust going past the rudder so you’re at the mercy of the prop spin. Simply put: you can only reverse one way. But not anymore thanks to this new Joystick system. Bow and Stern thrusters are integrated into the system, along with forward and reverse driven by the propeller. So now you have 360 degree control, all manipulated by the joystick. This has obvious advantages, like docking, but it also has huge practical applications to the tow sports world. Ideally you’re riding in glass calm conditions, so when your rider falls, you bring the boat to a complete stop, then slowly turn around and idle back to your rider to preserve the calm water and not send rollers down your line. With the joystick, when your rider falls you can spin the boat 180 degrees on it’s length and head back down in half the time and not having to cross your waves. Additionally if you miss the rider on your pass, you can use the joystick to get closer with precision. It’s a huge advantage that tow sports folks will “get” right away. Set out to not be another “me too,” Sea Ray has placed the propeller of the Mercury Inboard further under the all new Deep Vee hull, towards the center at the most efficient pull point they could get. 2000 pounds of integrated ballast help you get the size of wake or wave you want, and their “Wake-Tech” Plates will help you get the shape you’re looking for with multiple presets loaded into the Dynamic Display Screen system. This display system is nice to look art, but even better, it’s very intuitive and simple to use. You can have basic controls or as advanced as you would like, it’s up to you. Getting to run this boat at the Miami Boat Show, we unfortunately greeted with very rough conditions thanks to a strong westerly breeze. But what that did allow us to see is how this boat’s new Deep Vee design would handle the chop, and it loved it. It cut through the waves easily and the boat felt solid inside. Afterall, it is a Sea Ray. What I mean by that is the brand has a lot of pride and is a legacy in the boating industry. They’re not going to put that at stake by rushing a boat to market. They are going to make sure when they release something that it is set to dominate and be a part of the leading brand that Sea Ray is. Based on what I have seen so far, the new SLX-W 230 is off to a great start.